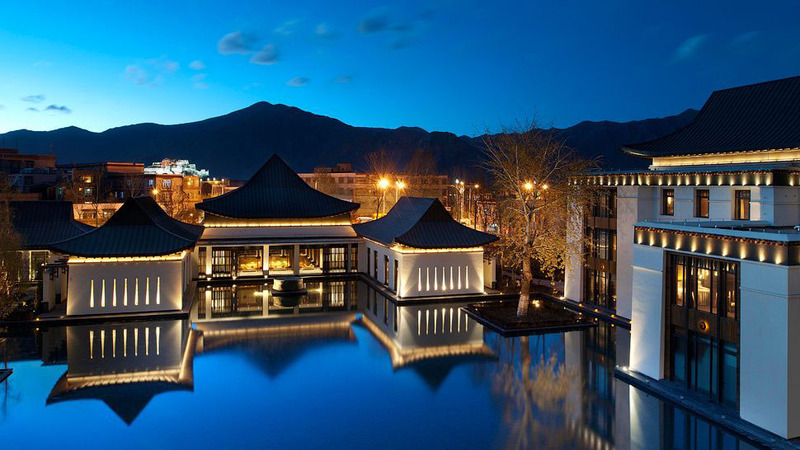 At 12,000 feet above sea level, the St. Regis Lhasa Resort in Lhasa, Tibet is one of the highest luxury hotels in the world. Inspired by the nearby Sera Monastery, the eight-acre resort hotel designed by Denniston International Architects combines the traditional Tibetan architectural elements with modern luxury. The hotel faces the stunning Potala Palace with views of the Himalayas and Lhasa Valley. The exterior of the buildings with stone walls and dark shale pagoda-style roofs pay homage to the ancient Buddhist culture. The interiors showcase works of art from local and international artists such as the six-panel painting in the lobby by Christian de Laubadère. The Iridium Spa has an ornate gold-tiled pool with artwork of a black and white Sea Serpent. Sustainable features such as solar panels and an underground water recycling system were also incorporated into the hotel design.